Day 3, I took the lesson learned the day before to heart and headed out to Centeroo around 9:30 in the morning. Of course, then, there was no line and I got into the area quickly. Shows don't really start until around noon, so I spent the time walking around a little bit and came across a nice little one-man show. I watched him for a few moments (he wasn't particularly good, just amusing), then headed over to the Cinema Tent which, thankfully, is open 24 hours a day and air-conditioned! There, I caught, for the first time in my life...Footloose. It may officially be one of my favorite movies now! After the movie, I explored some more of the non-music related features of Bonnaroo and caught a show of Stuffed and Unstrung an "alternative Henson" puppet show. It was like a dirty "Whose Line is it Anyway?" 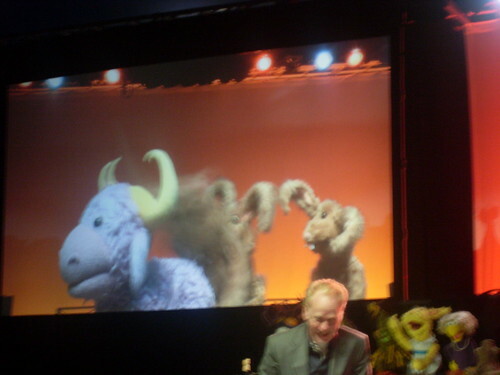 with puppets! It was amazing, definitely something all of you should check out if you ever have a chance. You don't even want to know what they're doing to that cow. I contemplated getting back in line to catch the next show, Donald Glover, but thought it best to head over to What Stage to make sure I was prepared for a show I wanted to catch later that evening. You see, at the main stages, Bonnaroo set up pit areas for those fans who want to get up close to their favorite acts. The catch is, you have to get in line and access is first-come, first-served. 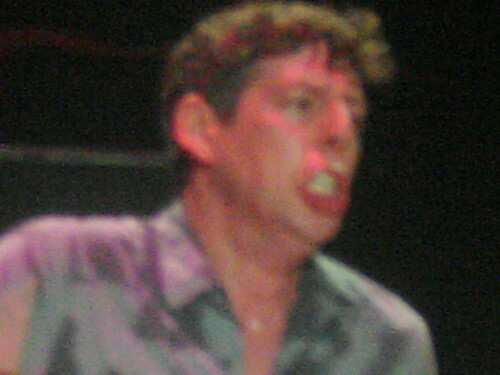 Once I got near the stage, I noticed that some people were already lined up for, I assumed, some of the shows that would be going on that evening. I decided it may be best to get in line soon for my show. I grabbed some food, then got in line. 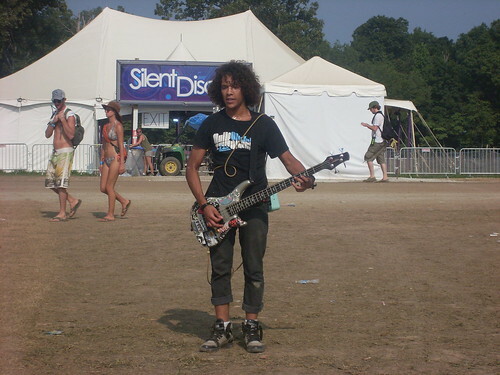 Once there, I had no choice but to try and enjoy the acts at the stage before mine. I caught the tail-end of Dennis Coffey, a well-established guitarist I had never before heard of. Next on was Black Uhuru, an unspectacular reggae group (though, to be fair, it's far from my favorite genre) I had also never heard of. Finally, Wiz Khalifa was on. While I had heard of him, I had never heard any of his songs (nor do I wish to ever again). I spent most of the time chatting with my line neighbors, two students from Louisiana and a cute young man from Atlanta (who, alas, I may never see again...sniffle). Finally, it was time to get up for the act I really came to see. We started to move into the entrance to pit area, fighting off some people who swore up and down that they had been sitting with us the entire time (they hadn't). After about another thirty minutes (most of us had been there six hours or more already), we were able to move into the pit. 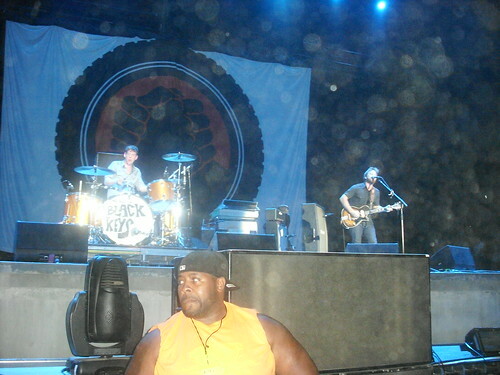 There, I found myself front and (nearly) center for one of my favorite bands...The Black Keys! 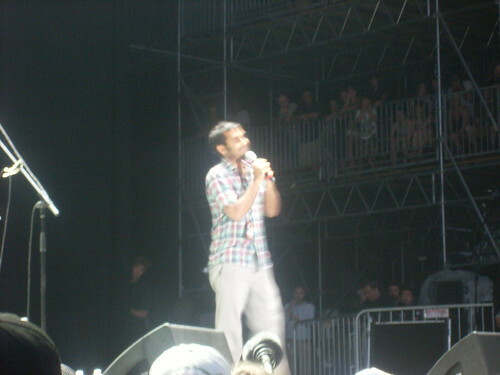 The band was introduced by Aziz Ansari, who first introduced them as The Black Eyed Peas, which elicited a cacophony of boos from the audience. He then "found out" that they had died in a horrible plane accident (cheers) and The Black Keys were the last minute replacement. Fine by us! The band came out and got right to playing. They played a mix of songs from all of their albums, reserving those from the latest, Brothers, for the middle when they brought out a bassist and keyboardist that helped to round out their sound onstage. 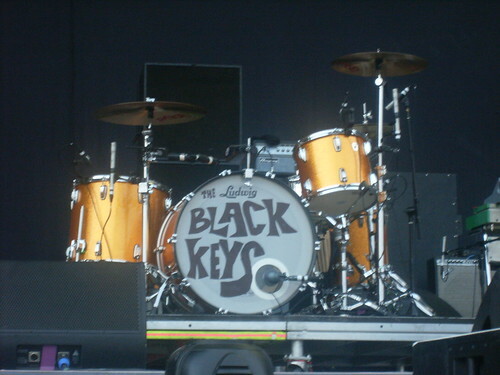 The duo is not big on gimmicks, only using a disco ball for a few songs and a light up "The Black Keys" sign towards the end to decorate their stage. Their charisma is enough to keep the crowd going. My mom says hi from Akron! I don't know what it is with drummers named Patrick, but along with Hallahan from My Morning Jacket, The Black Key's Carney is among the most entertaining drummers to watch. An amazing show and completely worth missing the better part of a day of shows to be front and center for!